Fact: The aging demographic has 70% of the wealth of our country, with two times the discretionary spending of the next generation. “There has literally never been a better time in the world to do what we’re doing,” says John Cochrane, President and CEO of nonprofit senior living provider Cornerstone Affiliates. 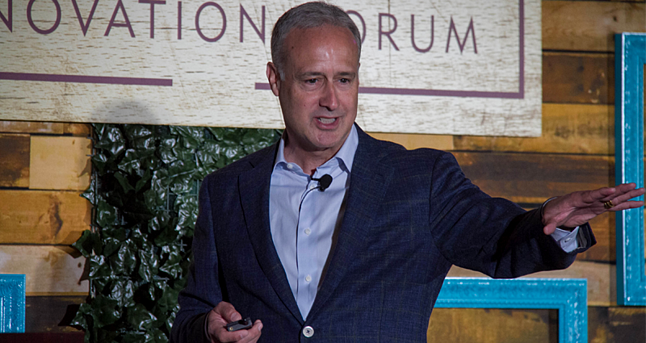 At the Senior Living Innovation Forum in Napa, Cochrane declared a golden time in the senior care industry. Unlike previous generations of seniors, there is a significant amount of money to be found. The reason behind this untapped potential is the biggest age wave this world has ever seen. Due to the large cohort of Baby Boomers, some are on the silver end of the spectrum while others have yet to show their first wrinkles. How we age has fundamentally shifted, and this translates into a call to action the industry can’t afford to ignore. To remain vibrant, vital and relevant moving forward, we must change the current reality that Baby Boomers don’t like us. Yes, the age wave is here to stay...but it’s sort of a tease. Our target audience is growing, but they aren’t easy-- they come to retirement communities out of desperation, not desire. Advances in health care have resulted in the longest life spans in history of the world. In the next 20 years, this unprecedented growth will double the American population aged 65 years or older. RSVP’s for the senior living party should be skyrocketing, yet a negative perception means our audience would rather die alone in their homes than give us a chance. That’s no exaggeration: 90% of surveyed Baby Boomers outright reject the idea of ever living in a retirement home. Of the 10% who toured senior facilities, 70% disliked what they encountered. That leaves 3% of a marketplace. So...what about that golden age we were just talking about? This new sophisticated, independent senior demographic isn’t just playing hard to get: these Baby Boomers are declaring they don’t want what we have. In other words, we need to do more than revamp our pick-up lines. Three percent market penetration signals this fact loud and clear. This is a call for leaders in the field to step up and embrace this time of change. In industries that face disruption, many companies lose their market share out of an inability to adapt. Think Blockbuster’s boot from Netflix, the de-throning of Sear's by Amazon, and the growing extinction of taxi cabs from their innovative predator: Uber. So, how do you tap into this innovation? Cochrane and his team devised three simple ways to capitalize on growing existing communities. If senior care companies can’t adjust business strategy as needed, newcomers will beat them. 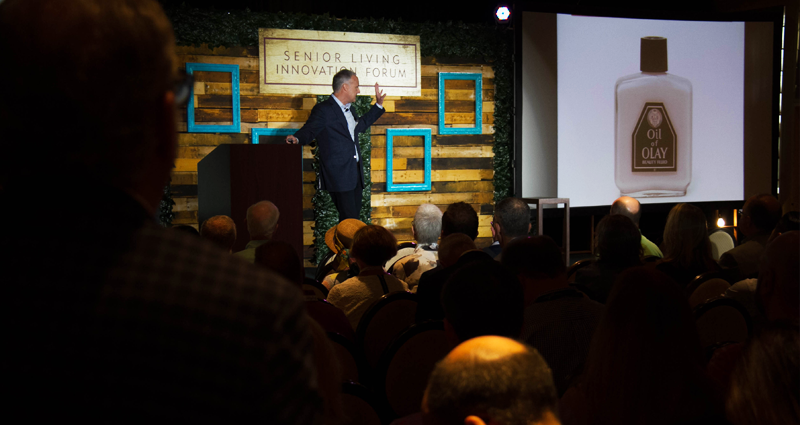 As an example, Cochrane cited Ginny Rommety, CEO of IBM, and her take on innovation: “We will need to reinvent ourselves every 5-7 years to stay competitive.” Senior living is no different. 2) Research what the customer wants. Spend time and effort to qualitatively and quantitatively discover what is important to the people you serve. Ineffective surveys can, and should, be replaced by deep dive research. Cochrane cited the rebranding effort of Olay and its successful pivot to anti-aging cream for middle-aged women (instead of their mothers). P&G used volumes of research to identify selling points for a new audience. By taking the time to genuinely understand their customer, it paid off with a multi-billion dollar product line. Find out what worries the new demographic about aging. When you understand their hopes and dreams in a transformative time where the meaning of aging has shifted, you can truly improve their lives. Create something of value and never stop seeking improvement through research. 3) We need a plan. With enough planning, preparation, training and careful execution, anything is possible. Innovative industry leaders can absolutely overcome the current obstacles, but no one can accomplish this change alone. To gain a competitive edge, we must realize the opportunities right in front of us and capitalize on them by sharing resources with others. “We don’t have to be all things to all people,” said Cochrane of his company’s approach to operations. 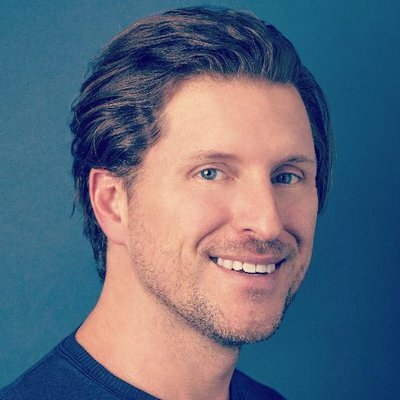 Partnerships, connections, and innovations are the key to thriving in this disruptive time. Watch John Cochrane's full talk below. Enjoy!